The Cowichan Valley Citizen has published an article about volunteers removing over 1000 discarded needles from the Cowichan River last week. This highlights the serious problem of discarded needles on streets and public spaces in and around Duncan. Below is an updated report I posted this website on 5 October 2018. This Cowichan River incident reinforces my argument that VIHA needs to do much more to get these discarded needles off our streets. But, as shown in the article below, VIHA is saying its current programs are adequate and is essentially denying there is a problem with discarded needles. I disagree; VIHA need to do much more to deal with this public health and safety problem. The Vancouver Island Health Authority (VIHA) has a program to distribute sterile needles free of charge to intravenous drug users as a way of harm reduction. In Duncan, the Needle Exchange on Trunk Road is part of this program, funded by VIHA through a contract with the Canadian Mental Health Association. But while this program undoubtedly has beneficial effects in preventing or reducing diseases and infections which can be transmitted among intravenous drug users through sharing or re-using needles, the fact remains that many of the needles (commonly known as “sharps”) distributed locally to intravenous drug users through this program are not returned to VIHA or to the Needle Exchange for safe disposal. Instead they are far too often being discarded on public streets and in public spaces where they present a public health hazard. I think the City of Duncan needs to contact VIHA to discuss solutions to this problem or, at the very least, ways to reduce the number of used needles and syringes discarded on Duncan streets and public spaces. Any contact with VIHA would necessarily need to be done in cooperation with Cowichan Tribes, the CVRD and the Municipality of North Cowichan. There are already efforts to collect these used needles and syringes. The Needle Exchange on Trunk Road is one part of these efforts. 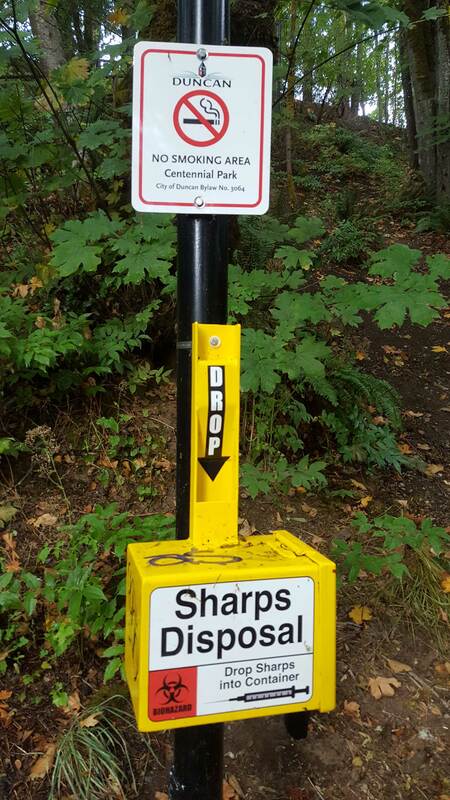 Another example involves secure Sharps Disposal boxes, like the one on the photo at left taken in Duncan’s Centennial Park, into which used needles can be safely deposited. The Needle Exchange also hands out portable sharps disposal containers, made of heavy duty plastic, which hold 10 used needles/syringes. A photo of a “Contaminated Sharps” container appears on the left. 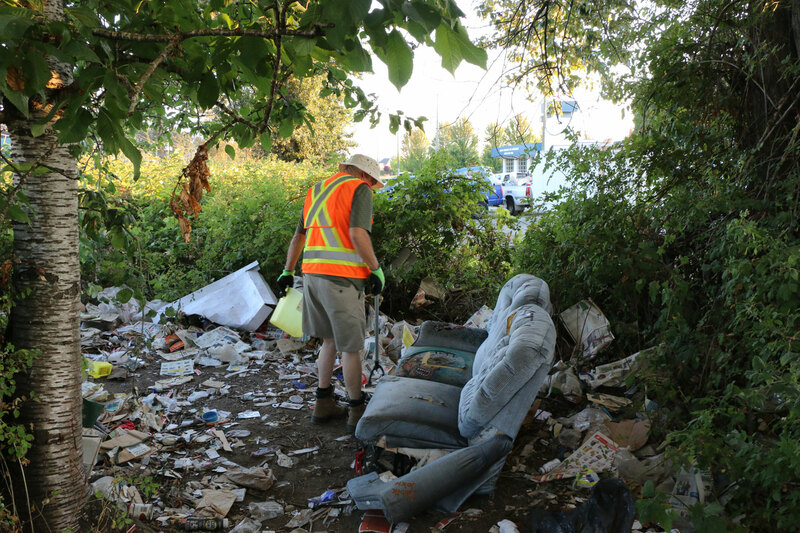 Another effort to recover used needles and syringes discarded on streets and publicly accessible spaces is carried out by the Warmland Sharps Pick Up Team, which is funded by VIHA through a grant to the Canadian Mental Health Association – Cowichan Valley Branch. The Warmland Sharps Pick Up Team recovered over 4400 sharps from local streets and public spaces in the month of August 2018 alone. While I commend the Warmland Sharps Pick Up Team for removing these 4400 used sharps from public spaces, the very fact that it did so illustrates the nature and extent of the problem. I went out with the Warmland Sharps Pick Up Team one morning in August. It was an interesting experience. One of the first stops was the park at the rear of the Cowichan Aquatic Center at 2653 James Street. 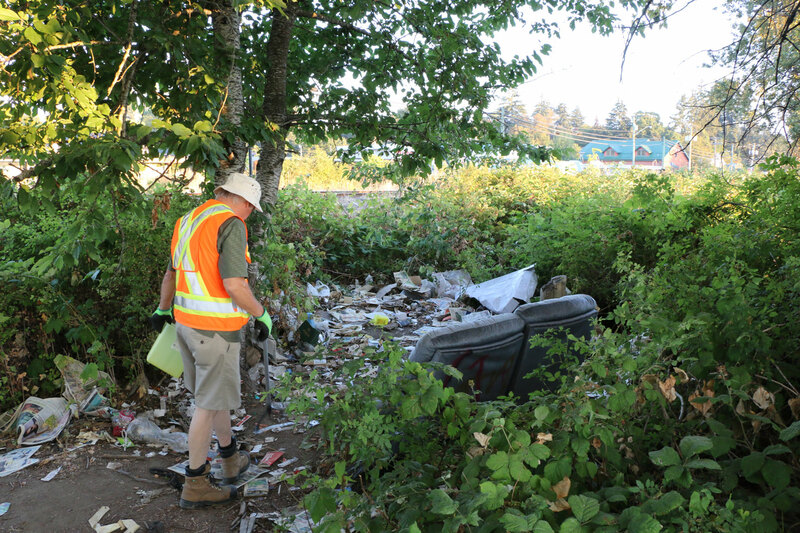 Alongside an outdoor skate park immediately north of, and adjacent to, the Cowichan Aquatic Center parking lot we came across a site with discarded needles and other drug related refuse. 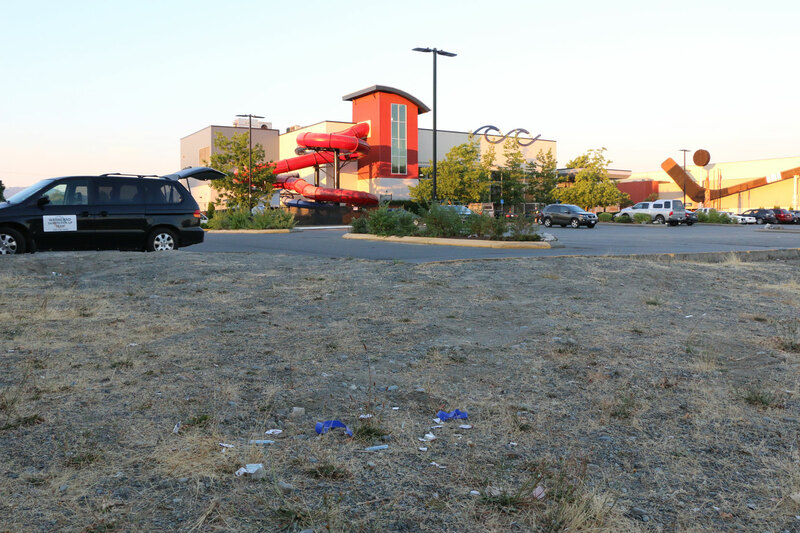 The photo below shows the location of the site in relation to the Cowichan Aquatic Center and its parking lot. We then went a few blocks west to a site on Duncan Street between James Street and Beverley Street. The three photos below show this site., which is near, and across Duncan Street from, the North Cowichan Fire Department South End Fire Hall at 5851 Duncan Street. Note that the Warmland Sharps Pick Up Team member shown in the photo is going into this site equipped with limited safety equipment; basically a pair of steel toed boots with a metal shank in the sole, a pair of gloves and a device with a long handle for picking up discarded needles and other items. He was working on his own and he told me that sites like this one are considered Hazardous Waste sites. 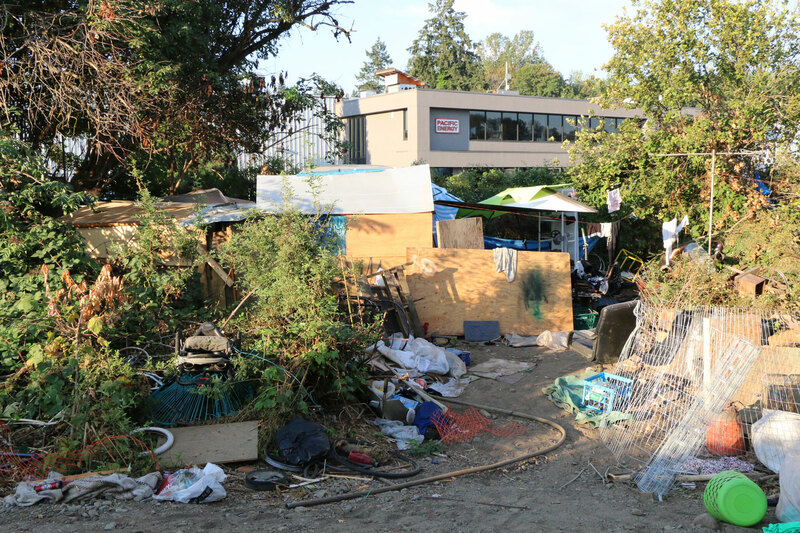 Contrast this situation with the Hazardous Waste site cleanup of 454 Garden Street [see our post about 454 Garden Street here] between 29 March-4 April 2018 which was done by a private contractor following WorkSafeBC regulations and using a five person crew dressed in full HazMat gear at a cost to the City of Duncan of $12,000. I was quite surprised to see a Warmland Sharps Pick Up Team member, working on his own, going into Hazardous Waste sites with very limited safety equipment. During my time working for a Crown corporation I served as an elected union rep and was involved in WorkSafeBC issues and a variety of workplace safety incidents and concerns. I know from personal involvement in unions and WorkSafeBC issues that a union would not tolerate workers going into Hazardous Waste sites, alone and without adequate protective equipment. Nor would WorkSafeBC. But that is what is happening here with workers under contract to VIHA. The photo below shows some of the drug related refuse at this site. The blue plastic vials contained distilled water used to mix a heroin solution. The orange wrappers contained powdered Vitamin C which is mixed with the heroin solution as an anti-coagulant. These items are handed out to intravenous drug users by the Needle Exchange in Duncan. After spending some time patrolling various sites in Duncan, we went onto Cowichan Tribes land and walked along the E&N Railway track between Trunk Road and Allenby Road. 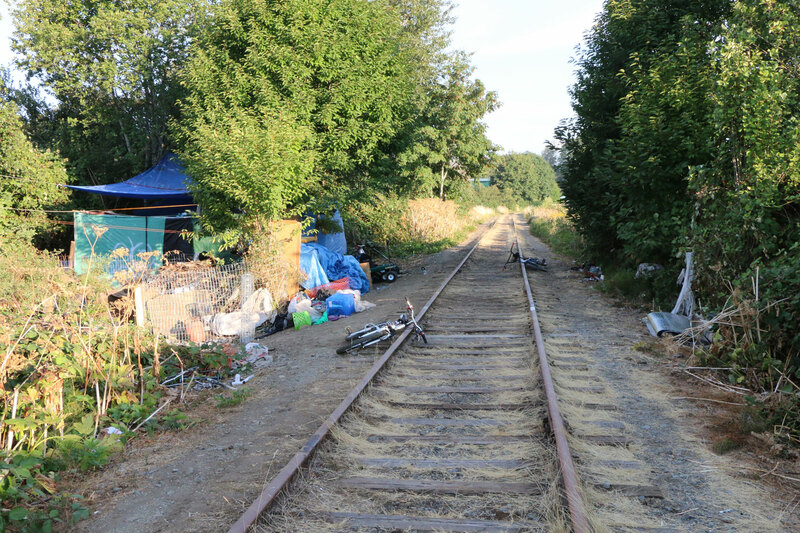 There are several encampments along this section of the E&N Railway track like the ones shown in the photos below. The Warmland Sharps Pick Up Team member I was accompanying told me that the residents of these encampments have told Warmland Sharps Pick Up Team members, in no uncertain terms, including threats of physical violence, that Warmland Sharps Pick Up Team members are not welcome in the encampments. 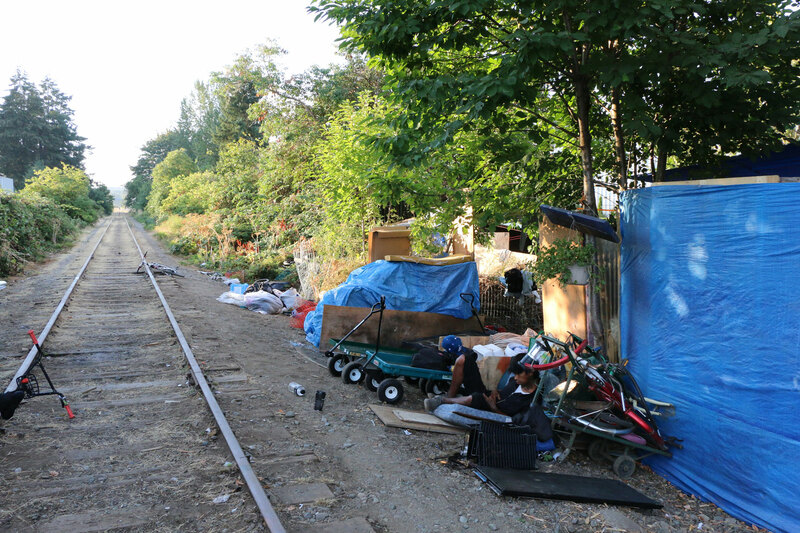 The Warmland Sharps Pick Up Team picks up discarded sharps on the E&N Railway tracks but does not enter the encampments. 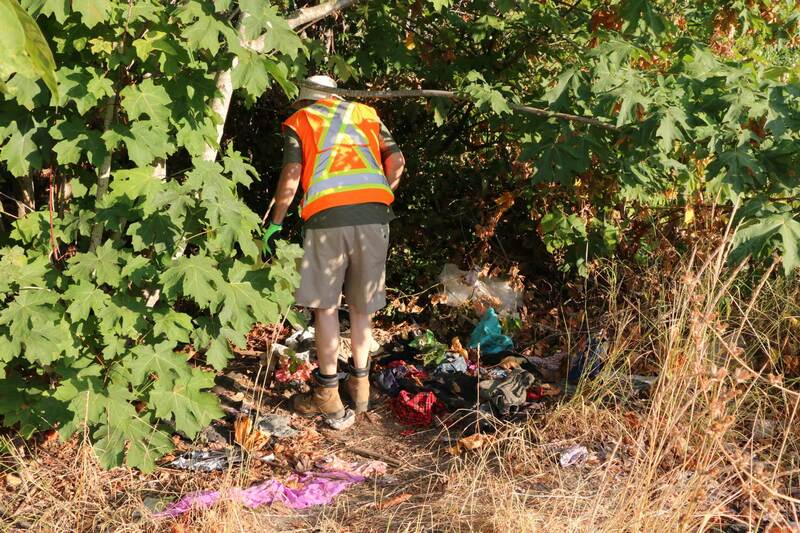 The photo below shows the Warmland Sharps Pick Up Team member I was accompanying investigating another site on Cowichan Tribes land near the E&N railway track. It seems to me that there are some definite problems with this. The Vancouver Island Health Authority (VIHA) has a program to distribute sterile needles free of charge to intravenous drug users as a way of harm reduction. This makes sense. But there doesn’t not seem to be an adequate plan to get these needles back again. Instead these needles are ending up being discarded on public streets and in public spaces. The Warmland Sharps Pick Up Team picked up 4400 discarded sharps from local streets and public spaces in August 2018 alone. But while that is a commendable effort the fact that there were at least 4400 discarded sharps on public streets and public spaces illustrates the fact that there is a serious problem with discarded needles in public spaces. VIHA provides financial support for the Warmland Sharps Pick Up Team. The Warmland Sharps Pick Up Team members are going out to collect these discarded needles with little in the way of protective equipment. They are going into places which would typically be considered HazMat sites without any HazMat protective gear. I asked the member of the Warmland Sharps Pick Up Team whom I accompanied what he thought some solutions might be. His first response was that the most effective solution might be to start a program similar to a bottle depot which pays the intravenous drug users a small fee, say 5 cents, for each sharp they turn in to the Needle Exchange. That makes some sense to me. People collect bottles and cans to return to the Bottle Depot for 5 cents per bottle or can so there could be a similar kind of program for sharps. But then what would happen if children started going out to look for sharps in order to collect cash for their return? That would create some unwanted public health and safety concerns. But the bottom line is that the current VIHA harm reduction program is handing out free syringes to intravenous drug users and many of those needles are not being returned to VIHA for disposal. Instead they are winding up discarded on city streets where they pose the potential for causing harm to others. In August 2018 the Warmland Sharps Pick Up Team picked up over 4400 discarded sharps from local streets. I think Duncan and other municipalities really need to have some serious discussions with VIHA about the problem of discarded sharps on local streets and how to reduce the problem. Duncan regarding the issue of discarded used syringes? If so, when? Prevention Site and Sharps (link to minutes). between VIHA and the City of Duncan available to the public? Health Centre, with no programs to encourage the self return of needles by users. activities in the Cowichan Valley, including designated drop-off locations, the installation of disposal units in targeted areas, and sweeps around the Warmlands facility. Note: I do not share the confidence VIHA has expressed in the last sentence of this response. I think Cowichan Valley municipalities will have take a collaborative approach to VIHA about this situation.